This is an oil on canvas board painting created by Charlotte Becker. This wide-eyed, rosy-cheeked baby is typical of the images that she was known for. This image was probably created for a calendar, as there is a print number on the back of the board. Some of the best illustrations of babies produced during the first half of the 20th century were created by Charlotte Becker. Charlotte Becker was born in 1907 in Dresden, Germany. She came to the United States at the age of 5. She studied at the Art Student's League and the Cooper Union in New York and was a member of the Society of Illustrators. Ms. Becker painted illustrations for calendars, advertisements, magazine covers, and children's books. Her works were published by McCall's and Toronto Star Magazines. She also wrote and illustrated her own children's books. 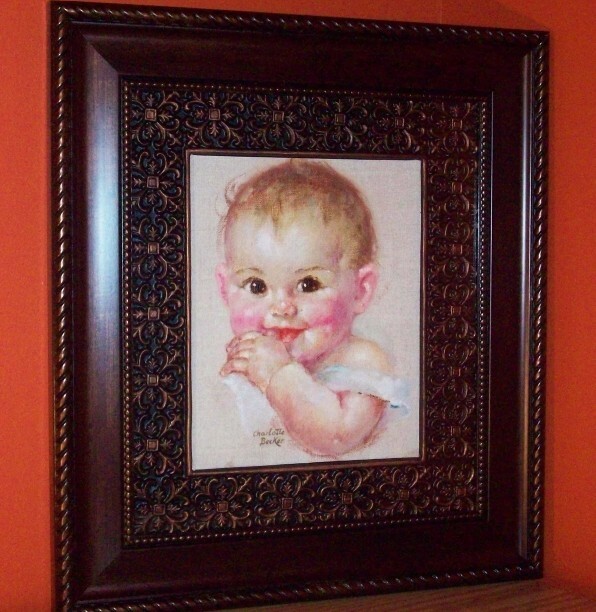 Ms. Becker is most famous for her wide-eyed, rosy-cheeked baby illustrations. She is also known for incorporating baby milk bottles into her calendar illustrations of babies. The 1949 Gerlach Barklow Calendar Company Title Leaves salesman's sample book states, "Early in life, Miss Becker showed a decided talent for art. Her school books were adorned with pictures of babies in every conceivable pose, and today she is known for her child studies". The 1958 Gerlach Barklow Salesman's Manual states, "The Charlotte Becker images are often referred to as the "dairy picture" due to the fact that they tie milk and healthy, happy children together at the breifest glance and there is no better way to sell dairy products." It talks of the surefire appeal of the healthy, chubby babies being universal. It says that some of Ms. Becker's first commissions were given to her by the Gerlach Barklow Calendar Company when she was a struggling young artist, just trying to get a footing in the advertising world. It boasts, "She has since gone on to nationwide acceptance as a baby artist and our customers are getting the very best when they select a calendar by her". Charlotte Becker passed away in 1984.